The depth and table of a diamond have a huge impact on its appearance and value. There’s no “best” depth and table for every diamond — instead, the ideal depth and table depend on the cut you’re considering. We’ve listed the best depth and table ranges for round cut diamonds, princess cuts and several other popular diamond cuts below, along with tips to help you get the best diamond within your budget. Looking for a reliable place to compare diamonds on depth and table size? Retailers like James Allen and Blue Nile list depth % and table % along with other important carat, color, clarity and cut information for all of their loose diamonds. When you’re comparing diamonds, whether for buying an engagement ring or other jewelry, it’s easy to get distracted by a diamond’s size, color and clarity. These factors make up three of the four Cs — in this case, color, clarity and carat. The fourth C is cut, a factor that’s every bit as important as a diamond’s size, color and clarity in determining its value. Two of the most important factors in determining the quality of a diamond’s cut are its depth and table. Below, we’ve explained exactly what these are, as well as what you should look for when you’re comparing diamonds. Look at several diamonds side by side and you’ll notice that they usually have one major feature in common: a flat, table-like surface. This part of the diamond is referred to as the table. On a modern round brilliant, the table is one of 58 facets on the surface of the diamond. As the top facet, the table lets light into the diamond and refracts it towards the facets on the top and sides, creating its unique, sparkly appearance. The size of the table is one of the most important factors in the appearance of any diamond. Not only does it let light into the diamond — it also disperses light throughout the diamond. What is the Ideal Table Size for a Diamond? While it’s important for a diamond’s table to be large enough to allow light in, a bigger table isn’t necessarily better. A good table needs to be balanced — it needs to be large enough to let lots of light into the stone, but not so big that it doesn’t refract light onto the crown of the diamond. The table of a diamond isn’t measured by its physical dimensions — instead, it’s measured as a percentage of the width of the diamond. Like other aspects of a diamond’s quality, the table of a diamond is graded from poor to excellent, depending on its quality. For a round cut diamond, look for a table that takes up between 54 and 60 percent of the diamond’s overall width (an excellent cut) or 52 to 53/58 to 60 percent (a very good cut). Here’s a beautiful 1.08-carat round cut with a table of 57%. For a princess cut diamond, look for a table that takes up 67 to 72 percent of the width of the diamond (an excellent cut) or 56 to 66/73 to 75 percent (a very good cut). See this example .90-carat ideal cut princess diamond with a table of 71%. For an emerald cut diamond, look for a table that takes up 61 to 69 percent of the width of the diamond (an excellent cut) or 57 to 60/70 to 72 percent (a very good cut). Here’s a very sharp .90-carat emerald cut with a table of 67%. For a marquise diamond, look for a table that takes up 53 to 63 percent of the width of the diamond (an excellent cut) or 52/64 to 65 percent (a very good cut). Take a peak at this stunning 1.50-carat marquise with a table of 58%. For a cushion cut diamond, look for a table that takes up 61 to 67.9 percent of the width of the diamond (an excellent cut) like this 1.61-carat diamond from Blue Nile or 58 to 60/68 to 70 percent (a very good cut). Outside these ranges, the table can negatively affect the look of a diamond. A table that’s overly wide can reduce the dispersion of light throughout the diamond, giving even a gorgeous stone a lack of fire. In short, a bigger table doesn’t mean better looks. Search for the 54 to 60% range for round cuts and 66 to 72% for emerald cuts and you’ll get the best balance of a classic appearance and fire from your diamond. What is the Depth of a Diamond? Great diamonds are all about proportion, with the depth of a diamond one of the most important factors in achieving optimal sparkle and visual balance. The depth of a diamond refers to its measurement from top to bottom, from the table on the top of the diamond to the culet at its base. 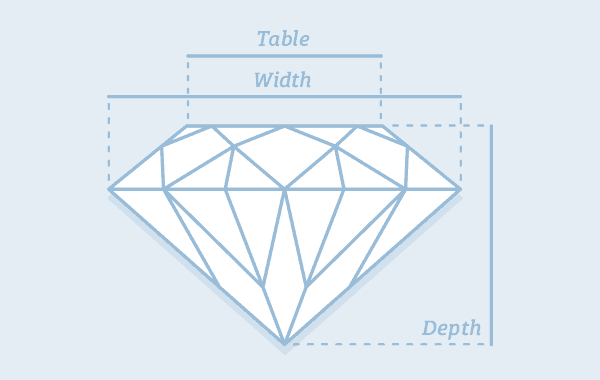 A diamond’s depth is expressed as a percentage, based on the total height of the diamond divided by its total width. As well as the depth as a percentage, most grading reports also include the depth of a diamond in millimeters. Like the table, a diamond’s depth has a huge impact on its appearance. A short diamond with a shallow depth will allow most light to pass through from top to bottom, reducing the sparkle and fire that’s visible when it’s exposed to light. This can also happen when a diamond is too deep. Because the different weight distribution, a diamond that’s too deep can look thinner and smaller than a shallower diamond of equal carat weight. What is the Ideal Diamond Depth? For a round diamond, an excellent depth range is 59 and 62.3 percent like this very nice 1.30-carat round cut. A very good cut can have a depth of 58 to 58.9 percent, or 62.4 to 63.5 percent. For a princess cut diamond, an excellent or very good depth range is between 64 and 75 percent of the total width of the diamond. Here’s a beautiful 1.12-carat princess cut with a depth of 72.9%. For an emerald cut diamond, an excellent depth range is 61 and 67 percent of the width of the diamond, while a very good depth is between 59 and 60.9 or 67.1 and 70 percent. See this excellent emerald cut example with a 64.6% depth. For a marquise diamond, an excellent depth range is between 58 and 62 percent of the total width of the diamond, while a very good cut will have a depth range of 56 to 57.9 or 62.1 to 66 percent. Here’s a 1.21-carat marquise cut with a excellent depth at 59.7%. For a cushion cut diamond, an excellent depth range is between 61 and 67 percent of the total width of the diamond like this 1.53-carat beauty, while a very good cut will have a depth of 58 to 60.9 or 67.1 to 70 percent. Because depth and table play a huge role in determining a diamond’s appearance, brilliance, fire and value, they’re two of the most important factors to keep in mind when you’re shopping for diamond jewelry. Using the recommended depth and table percentages above, you can easily rule out diamonds that aren’t cut well, helping you avoid low-quality stones during your search. It’s important to remember that while ideal depth and table are important things to look for in a diamond, they’re not the only things that you should pay attention to. Pay attention to the three other Cs — color, clarity and carat — and you’ll find it easier to pick the right diamond for you. Need help choosing the right diamond? Reach out to our experts and we’ll help you find the highest quality diamonds for your preferences and budget.